It is September 1st and that means today is the first day of the Holiday Mini catalog. 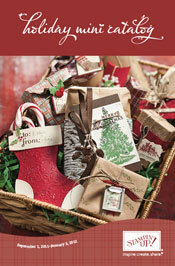 You can browse thru it here http://204.228.150.61/catalogs/flash/en-US/2011_ldse3_holidaymini/index.html. and start making your list and checking it twice. I have already been playing with some of the items that I pre-ordered but the its a Wrap Holidays on page 14 is on the top of my September wish list! Make sure to check out the fabulous Advent Calendar on pg 36 because Cammie is working up a class kit that will knock your stockings off. Sit back, relax and enjoy this Holiday mini.